This is a personal piece of writing about a group of painters who have given me a great deal of pleasure over the years, and have acted as catalysts in so far as my own artistic endeavours (as a writer, not a painter) are concerned. In many ways, I would go so far as to say that the painters have stimulated me more often than writers. But I deliberately use the word 'stimulated' because writers have certainly had an influence when it comes to technical matters of language and style. What the painters have done, though, is to provide the initial impetus towards creating something. It has often been an encounter with painting which has inclined me towards wanting to create. The work of certain abstract painters in particular has frequently been the springboard for a leap of the imagination into poetry or prose, even when that poetry or prose has been concerned with a very non-abstract world. I doubt that the painters would be at all surprised by this, their view being that they didn't see themselves as working in an abstract way at all. In any case, it has never seemed to me that it's necessary to be influenced only in a practical way. As I said earlier, it is the impulse to create that is made available to me by paintings. The great art critic, Meyer Schapiro, talking about the influence of exiled surrealist artists on the young American painters who later formed the New York School of Abstract Expressionism, said: "It wasn't automatism that the Americans learned from the surrealists, but how to be heroic." Making sense of the world, in whichever way one chooses, often does require acts of heroism, even if they're small ones. So, it is to the American painters that Schapiro referred to that I turn when I think I need stimulating. I first encountered painters such as Jackson Pollock, Franz Kline, Mark Rothko, and Willem de Kooning, sometime in the 1950s. As a historical note, I should say that they're often referred to as the New York School, and it's true that most abstract expressionists lived there, at least in the early days. And the dealers and critics in the city obviously provided the necessary response to their work. But there were painters moving along similar lines in other places, notably on the West Coast. Clyfford Still is an example of someone who had a profound effect on West Coast painters, though he himself was never rooted in one place. And the San Francisco abstract expressionists have never been publicised in the way that the New Yorkers were. Few, if any, paintings by West Coasters like Hassel Smith, Jack Jefferson and Richard Diebenkorn, have had wide circulation in this country, and even artists like Sam Francis and Mark Tobey are relatively unknown in comparison with Rothko, Pollock, etc. I have no interest in setting up arguments in favour of one group or another, and simply point to a mistaken tendency to see abstract expressionism as solely related to New York. Of course, Jackson Pollock's 'action painting' captured the public's imagination, as did his hard-drinking lifestyle. It was, perhaps, the lifestyle as much as the painting which made Pollock famous. After all, an alcoholic artist who paints massive abstracts supposedly by flinging pots of paint at canvases laid out on the floor, and who later ends his life in a drunken car crash, is almost made for the popular press. And the 'facts' of his life can easily be used to divert attention from any serious consideration of his art, thus allowing the audience to avoid having to think. I'm not an art critic and it's not my intention to offer a detached aesthetic appreciation of abstract expressionism. It is the personal effect that the paintings have had which interests me. I've always found in much of Willem de Kooning's work a wonderful reaction to the city. I recall coming out of the Tate Gallery in London after a de Kooning exhibition in the late-1960s and realising how alive I was to the colour, noise, vitality, and variety of the streets. In Dore Ashton's fine book, The Life and Times of the New York School, she says of de Kooning: "He loved the complexity of the cosmopolis, and he found in its physical appearance an excitement and beauty that he consciously tried to reflect in his paintings." 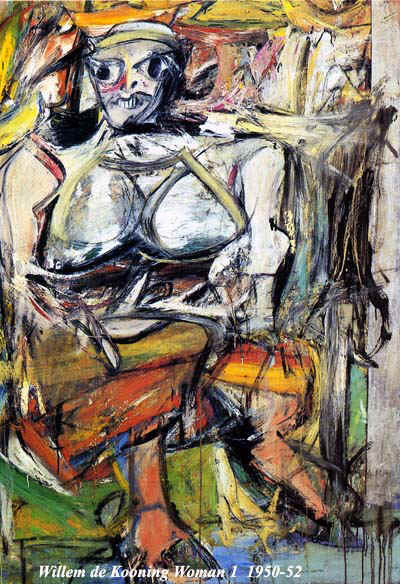 I read that only a few years after first encountering de Kooning's work, and it confirmed what I'd felt about the paintings. With a painter like Franz Kline, possibly my favourite of all the abstract expressionists, it similarly struck me that his large black and white canvases were also representative of urban life, it may be a tougher street-wise version of it when compared to de Kooning, whose European sensibility still came through despite his years in America. Kline was once described as "a night person, drinking with friends first, painting later, and sleeping during the day Kline's nighttime joy, his love of night as a congenial time permeates the warm, expansive blacks in several of his abstractions. Like night itself, these paintings are filled with unpredictable encounters with light: incandescent flashes and glowing reflections." Interestingly, it always seemed that Kline was the least talked about of the abstract expressionists, both in terms of conversational focus and critical evaluation. Unlike some of the other painters he appeared to have little or no interest in theory - a friend remarked "He was perhaps more untheoretical than anyone I can think of on the American scene"- and it has been suggested that his work almost disarmed critical analysis because "it was just there There's a rightness about the thing. And it sort of cuts discussion." But other painters were alert to what he did, and there is a marvellous description by Fred Mitchell which stresses how much Kline related to his city environment: "We took a trip on the ferry boat at night and, looking at the city, I felt that too. His paintings did remind me of certain sensations, and everyone had already commented on that painting in Utica called The Bridge that looks just like the Brooklyn Bridge. Well, you get the idea that maybe it is or maybe it isn't, but it relates to it. I think it's as much the structure of the bridge as it is the girders. It's the atmosphere of cities that he really liked. He also liked the changes. as you look at the edges of a city, you see abrupt changes. I think it's the edges of things that he particularly liked. And I think as much as anything else, it is a contrast of scale you get there: the little bars nestled within the shadows of these huge buildings. And everyone is excited by Battery Park and the way the whole city comes together there. And the streets converge and there are little pockets of light. When you're in the middle of the city, you're not quite aware of these things. But when you're all around the edge. And Kline had walked all along South Street." Kline may not have had much time for theory but he could point to the central characteristics of his fellow-painters' work in a few, well-chosen words. "With de Kooning, the process is continual change. and the immediacy of the change. With Pollock, it's the confidence you feel from the concentration of his energy in a given picture." The comment on Pollock is a remarkable summing-up of the effect of his seemingly wild, but actually beautifully controlled paintings. Other painters could be equally articulate. I recall a book of interviews, published in the 1950s, in which Mark Rothko declared that what really interested him was, expressing basic human emotions - tragedy. ecstasy, doom. and so on-and the fact that lots of people break down and cry when confronted with my pictures shows that I communicate these basic human emotions." In a way, that statement almost explains why the painters act as a stimulus for my own creative work. It is not a question of technical influences, but instead a matter of emotion. If I'm moved emotionally by a painting it makes me want to respond, and the way of responding may well be to release my own creativity. And to quote Franz Kline again: "The final test of painting, theirs, mine, any other, is: does the painter's emotion come across ?" I have to admit that there are other reasons why the abstract expressionists have always interested me. I've never thought that art stands apart from society, and I can't share the tastes of those who think that our reactions to paintings should be a matter of pure aesthetics. With the New York painters I always felt that what they were doing had a social, even political side to it. It's possible to look at the history of the movement and see how the artists had been affected by left-wing ideas in the 1930s. Robert Motherwell said that the Spanish Civil War was the most moving political event of his youth, and in the 1950s he painted a whole series of "Elegies to the Spanish Republic." In the 1940s, Ad Reinhardt aroused the ire of the authorities with his support for left-wing causes, and even in the 1960s the FBI had files on Reinhardt, Mark Rothko, and Adolph Gottlieb. I don't want to go into this too much - some academic studies are now being made of the 30s background and its continuation into the Cold War politics of the 40s and 50s, so it is possible to read about it - and it's more the general statement that I think the abstract expressionists were making that interests me at this point. David Craven, an astute and informed commentator on the painters, has summarised it neatly. " Far from being an intended flight from reality, the myth-making of the Abstract Expressionists was instead conceived as a visual declaration of critical distance from a contemporary U.S. society that was deemed inadequate." And, to return to Meyer Schapiro. who I quoted near the beginning of this piece, he said that the qualities of abstract expressionist painting "may be regarded as means of affirming the individual in opposition to the contrary qualities of the ordinary experience of working... If the painter cannot celebrate many current values, it may be that these values are not worth celebrating.... painting by its impressive example of inner freedom helps to maintain the critical spirit." There is a great deal of truth in that and I'm sure that my own response to the paintings has been partly conditioned by what they represent in terms of a stance critical of the wider society. They offer a way of seeing the world that does not fit in with the official view of things. It is true, of course. that abstract expressionist work was incorporated into the official viewpoint as part of the Cold War process, the individualistic artistic revolt of the painters being used as a weapon of American freedom as opposed to Communist totalitarianism But this does not necessarily mean that the painting could not continue to offer an area worth exploring to those who were as opposed to the contradictions of capitalism as they were to the restrictions of communism. Of course this is the intellectual side of the matter, one that I have an interest in and love to read about. But my initial response always determines how and why I relate to the painters. I walk into a gallery, or look at a reproduction in a book, and I feel the excitement rise, and that, I would suggest, is what ought to be the first response to any work of art. The intellectual appraisal. the critical observations, the attempts to define why one feels a certain way about something. can come later Without the excitement nothing begins It's a joy to me that. forty and more years after I first encountered the work of Pollock. Motherwell, Kline de Kooning, Rothko, and the others. I can still feel that excitement It also pleases me that I am, in a sense, still on a voyage of discovery and I learn something new each time I encounter the paintings And it could be that. as the historical record is adjusted and lesser-known painters are reevaluated and groups like the San Francisco abstract expressionists reappraised. I will have the opportunity to see work that hasn't been easily available in the past. I want the feeling of excitement and I need the stimulus to my own creativity. There is one final matter that I want to mention, and it relates to the artists' lives and not so much to their paintings. I was always impressed by the dedication and seriousness with which they approached their work. In recent years, abstract expressionist paintings have sold for vast amounts, and it's true that once they had been acknowledged most of the artists had sufficient income to live quite comfortably. Just prior to that they had scuffled to stay alive and had refused to compromise in order to be accepted. When fame and money did come they were often uneasy about both. In some cases they didn't necessarily change their attitudes or their life-styles a great deal. 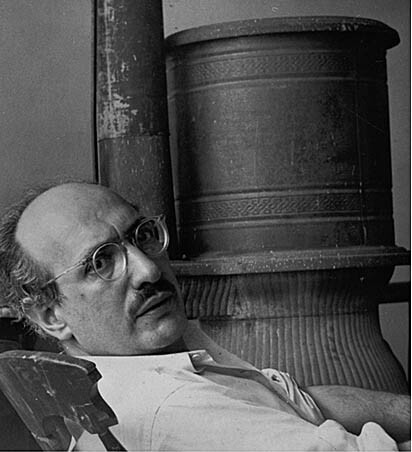 There is a story about Mark Rothko. drunk and angry arguing with Robert Motherwell and telling him, "its obscene to spend more than five dollars on a meal ' This in 1969, when Rothkos income from painting was around two hundred thousand dollars a year. But as his biographer, James E. Breslin, said "Rothko was not interested in elegant clothes, fancy cars, beautiful furniture, lavish entertainments, or extravagant restaurants. It is not that he was cheap he could be quite generous - but. as the child of a poor family and a product of the Depression, he was frugal. Material objects offered no consolations, or even distractions, to a man whose empty works sought to transcend them." I think that, in many ways, most of the painters, if not frugal like Rothko. had a practical view of money once they began to get it. It enabled them to buy paint and canvases, move to better studios, travel to see paintings they wanted or needed to see. But they had no interest in money as a status symbol and often continued to dress and behave much as they had always done Painting was what interested them. And there does seem to be a general acceptance of the idea that people like Kline and de Kooning were deeply suspicious of what money would do to the community of struggling artists that had existed in New York and which had provided its own critical environment, entertainment, and systems of mutual aid. Philip Pavia, speaking of those days. recalled how. "Franz was - he was broke. I wasn't rich, but I just had more than they did. There wasn't much money - five bucks. ten bucks But they'd give it to others too They all helped. Every time they couldn't pay the rent, they would call I used to go to Tom Hess. or I'd go to about three other people, and I'd get money for the rent and I would help Bill. Milton Resnick was broke too." And Ray Spillenger, who knew both Kline and de Kooning in the early days. reminisced about Kline being angry and frustrated when success came. knowing that it would take away his freedom, and he also said how de Kooning realised that the arrival of big money spelled "the destruction of the whole scene"